Founded roughly 75 years ago, the McDonald’s chain is the largest burger chain in the globe and it is because of the high standards which they maintain that they are able to attract over 60 million customers each day. Working for McDonald’s isn’t easy at all and requires you to be on your feet throughout the day. One of the first places people go to when they are craving a burger is good old’ McDonald’s which is both affordable as well as with a nice relaxed ambiance. 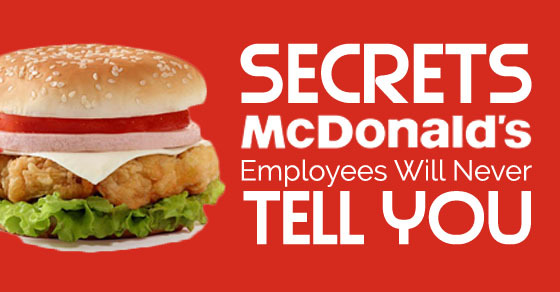 What you will read below are McDonald’s secrets that employees are never going to reveal to you. If you were unaware of the fact, but fries in any McDonald’s are made in bulk, especially since fries is one of the most popular items on the menu eaten by almost all the customers who walk through the door. In each set or batch, there is a specific ratio of potatoes and salt. If you state while ordering that you would not like any salt in your fries, you are causing a great amount of inconvenience to the employees. However what employees won’t tell you is that ordering fries in this manner assures that you are getting a fresh stack as they will have to make a special batch without salt for you. It is no great mystery that these fried delights aren’t very healthy at all and it is not advisable that people eat these food items too many times in a week. So if you as a parent are bringing your kids to the McDonald’s quite a number of times in the week, then, yes they are going to be judging you, as it silently communicates to them that you are someone who would rather make the trip to McDonald’s than simply whip up a salad or a sandwich which would honestly be a much healthier alternative to young growing children. Ordering a happy meal for your little one might make your little angel very happy indeed, but you can be assured that it makes the employees most unhappy. The happy meal involves so many little things which have to be put together and is obviously rather time-consuming for everyone concerned. It is due to this added time taken to serve one customer that the line begins to become even longer much to the irritation of not merely the other customers who are waiting in the line but also for the employees. Though ordering a special item on the menu might make you feel very special indeed but you should know that orders like this take a length of time, since these special items which go into making the item are not prepared beforehand given the fact that they are not ordered very often. So if you are in a hurry and the person at the counter assures you that your meal will be ready in no time, you should know better and understand that it most certainly is going to take a while. So if you have somewhere to be, you are better off ordering something simpler. Customers that come driving up to the window are the ones who are attended to first as opposed to the ones who come to dine at the restaurant, this is because it would be disastrous for the restaurant to try and manage the traffic if it happens to go out of control. You will never be told this but even if a customer dining there orders first the customer at the drive-through window will receive his food before. In the event of you being on a tight schedule, it is advisable that you do not get out of your car in order to grab your meal, driving up to the window will guarantee you a meal in a much quicker manner. Employees are trained to be polite at all costs and they will never tell you that the thing they find most annoying is when you stand in a long queue, without thinking about what it is that you would like to order. And finally when you do reach the counter then you decide to take your time in order to narrow down upon what you feel like gorging upon. Doing this is incredibly time to consume and is bound to get you a lot of dirty looks from the employees as well as the other customers waiting behind you in the line. McDonald’s customers will never reveal to you the amount of food which is dumped into the trash each and every day. The startling amounts of food which go to waste is indeed jaw-dropping. It is a rule that the food cannot stand in the racks beyond a certain amount of time, once that stipulated time is up then the food has to be tossed into the nearest bin. The food cannot be handed to a poor person, lest they might file a lawsuit against the company in the event of getting sick. So if they want to eat it they have to fish it out of the dumpster and there are many people who do just that! Though as employees they are delighted to help you and all that, but in actual fact after long shifts of work, they often secretly wish that you do not come to their register to place your order and rather opt to go to another one. People might believe that working at McDonald’s cannot be a stressful job, but it most certainly is as it not merely means that you have to do a lot of things at one time, but it also means that you need to have a smile on your face at all times. Being stressed out, in a hot kitchen, with a smile on your face is most certainly not an easy job at all. In addition to never revealing to you exactly how the kitchen is organized in McDonald’s, an employee will never reveal where the special products come from or even what secret ingredients go into making the perfect burger for you. Many young students opt to work at McDonald’s for their first job as they know that working for the company they will learn to multi-task and even carry out orders in an efficient manner. You need not be an aspirant chef if you want to work at McDonald’s for your first job, as it will also help you be a good leader and an efficient team player. What employees do not reveal is that behind the counter there is a lot of fun that happens, which others are better off not knowing about. Their fun does not involve anything unethical or unhygienic it is just some inside jokes or tomfoolery. Things like this help keep all the employees in good spirits so that though they are working for long hours they do not feel stressed out and under the weather. This fun that they have helps make that smile on their face a lot more natural. Most of us walk into a McDonalds hoping to try out the newest burger which has been included on the menu and which we have seen being advertised on the television. Yet it is unfortunate that the burger which we receive is hardly ever as good looking as the one which we happen to see on the television. At such times, an employee will never reveal to you that at some point or the other they too have tried their best to replicate the burger, yet no matter what they do it somehow that never looks the same. Employees will never say it out loud, for the sheer fact that they might get fired, but they actually love being given a duty in the lobby much more this is because the job is less stressful. In addition to that if they are on lobby duty they can frequently slip away and take a little break of their own. This is something which is done most often than not but not to the point of things meeting the eyes of the manager. 13. All the leftover food can be eaten by them every night! Though it is often frowned upon when older people work at employees at McDonald’s what many people do not know is that the employees get to take home all the left over’s at the end of each day. For people who are not very well to do, getting a free meal like this is indeed a blessing which they could not be more grateful for. This guarantees them a free meal every day because every day there are more or less the same amount of left over’s that remain. Employees might not get a chance to take a break or even run down the road to grab a snack. At such times all they do is a snack on a few fries and nuggets when the person in charge is not looking. This gives them the energy which they need in order to keep working in an efficient manner. So what you pay great amounts for, they get to gorge on through the day, free of costs. Sometimes managers do catch a glimpse of this but employees can just say that they are sampling the food. Many customers who come through the door are very rude and treat the employees as inferiors. As a kind of payback, employees ensure that these people are charged for the sauce which others who are nice and jovial get for free. Though it is popularly believed that waiters and chefs follow the ‘ten-second rule’ and even pick off food from the floor just so that they do not have to go about cooking it again. In McDonald’s, the employees will never be caught dead doing something like this. They will never reveal this to you because they do not think that there is anything to reveal about this base action. Going through the list might come as a bit of a shock to you as these are things which employees will never reveal to you on their own. As employees of this prestigious burger chain, they are expected to always be jovial, polite, happy as well as accommodating. Yet all in all everyone knows that employees are the backbone of any company without whom no company will be able to function in an efficient manner. The employees of this chain constantly strive to give their best no matter how tired and overworked they are. It is not for nothing that all of us crave their ice cream sundaes, burgers, fries, tacos and even the breakfast menu.